Dunes, dugongs and a town called Denham: there is more to Shark Bay than dolphins at Monkey Mia, writes Kerry van Der Jagt. For such a big slab of land, Terra Australis Incognita ("unknown southern land") was tricky to find. Some early explorers missed it altogether, some ran aground not knowing what they'd hit, others, like pirate-turned-plant collector William Dampier, stepped ashore, gathered some samples and continued on their way. Only Dirk Hartog thought to leave behind a memento of his visit, an "I was here, 1616" in the form of an inscribed pewter plate nailed to a post. Unimpressed by the barren land, he departed two days later. "That's where Hartog landed," says my pilot, pointing to Cape Inscription on the tip of Dirk Hartog Island, a string bean of green floating in a blanket of blue. Located 830 kilometres north of Perth, Dirk Hartog Island is in the Shark Bay World Heritage Area. The four natural criteria for World Heritage listing are exceptional beauty, dynamic ecology, biological diversity and evolutionary history. Shark Bay is best known for the dolphins at Monkey Mia, but I've arrived in search of history and dugongs. From Denham, the only town in the region, it's a 30-minute flight to Dirk Hartog Island. Viewed from above, the mainland looks like an Aboriginal dot painting of green spinifex, white gypsum and perfect circles of turquoise lagoons. We are met at the runway by Tory Wardle, who, with her husband Kieran, operates the only accommodation on the island, the Dirk Hartog Island Eco Lodge. On the calm eastern side of the island, the lodge is housed in the original limestone shearers' quarters built more than a century ago. With an absolute beachfront location, the lodge is a driftwood of a place, the kind I imagine Ernest Hemingway would wash ashore on. The electricity is generated mostly by the sun and wind, home-cooked meals are served overlooking the bay and there's an island-style bar and billiards room. In 1993, Kieran Wardle took over the pastoral lease from his grandfather, Sir Thomas Wardle, and set about establishing an eco retreat. He began by culling the feral goats, then, in 2007, he destocked the island, loading all 4000 sheep on to barges and transferring them to the mainland. 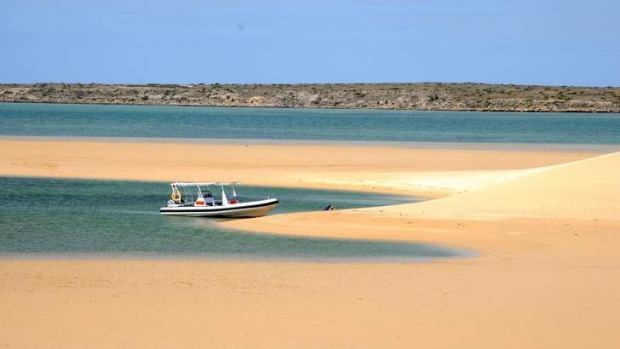 In 2009, the island was declared a national park and the Department of Environment and Conservation (DEC) embarked on "Return to 1616", a project that aims to restore the vegetation and habitats to how Dirk Hartog would have seen them in 1616. By the 400-year anniversary in 2016, there will be much to celebrate in Shark Bay. After lunch Wardle takes me and the two other guests for a drive to the "Wild West", the side of the island that faces the Indian Ocean. Here, white waves claw at the 150-metre high cliffs, ripping at rocks and leaving behind gaping fissures and blowholes. as the waves inhale through the blowhole and exhale like a jet engine. "This island is a conservation ark," he says. 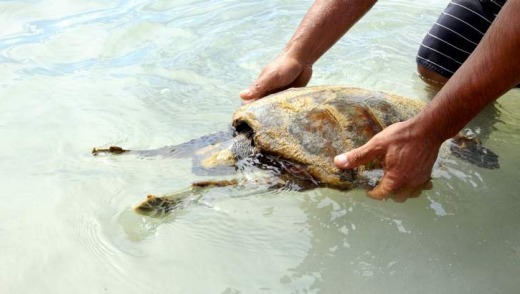 "We have the largest loggerhead turtle breeding colony in Australia and the largest breeding colony of pied cormorants in WA." Dugongs also frequent the waters, as Shark Bay has the world's most extensive seagrass meadows, providing habitat for more than 10,000 dugongs - about one-eighth of the total population. The Wardles are also proud of the island's early European history. They have a replica of the Hartog Plate hanging in the lounge (the original is in the Rijksmuseum in Amsterdam) and can arrange trips to Cape Inscription as well as to William Dampier's landing site. While Kieran provides the enthusiasm and nature serves up the wonders, Tory brings the treats; gourmet meals, homemade biscuits, an armful of books, a driftwood sculpture, even a picnic hamper if needed. Over the coming days we explore more of the island, solo and in groups, on foot and by boat, kayaking, swimming in quiet bays, exploring sand dunes and staring dumbfounded at fossilised reefs from the last ice age. I fall asleep to the sounds of the sea and rise with the sun. One morning I kayak around Mead Island, the colonies of crested terns and cormorants barely raising a feather. On a sunset walk I'm trailed by a lone dolphin, its dorsal fin drawing a pencil line across the silvery sea. 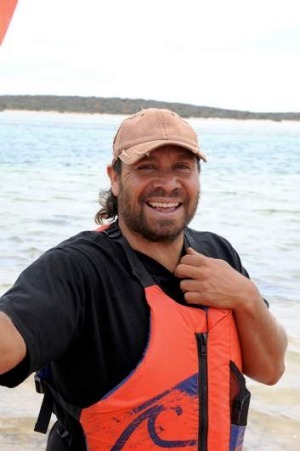 Shark Bay's indigenous history is just as bountiful and to learn more I head back to Denham to join Darren "Capes" Capewell on his Saltwater Dreaming tour. "You're on blackfella time now," says Capes with a grin, catching me checking my watch. Capes, who was born to a Malgana father and a Nhanda mother, started offering kayaking tours in late 2011, in addition to his walking tours. "Many people come to Shark Bay just to see the dolphins," he says. "But they leave empty, they don't take any spirit from here." Our tour starts in Francois Peron National Park, with Capes pointing out emu tracks and medicinal plants and telling me the indigenous names of animals. We laugh at my attempts to pronounce the words but, once learned, these tongue-twisting sounds help make sense of the place. "These words explain some detail about a place and help us connect to country," says Capes. "My people call this place Gutharragunda, which means 'two bays'." The sun is hot overhead as we thread our way through the salt bush, munching on the sweet, purple berries of the gunulga bush and the onion-flavoured roots of the warrinyu yam. Periodically, Capes calls out to his ancestors, introducing me and reassuring them that my "ears are open". Capes explains that Shark Bay is very powerful country, situated at the junction of red sand country and white desert country. "My people have known this for 25,000 years," he says with a shrug. "We didn't need UNESCO to tell us." This leads to talk about the stromatolites at Hamelin Pool, one of only three places in the world where living marine stromatolites exist and a major factor in Shark Bay achieving World Heritage status. "Scientists tell us these stromatolites are linked to life forms found on earth up to 3.5 billion years ago," says Capes. "We've always referred to them as our 'old' people." Lowering our kayaks into the still waters of Big Lagoon we have the place to ourselves, the only sounds are bird calls and the sluice of water against our bows. After 30 minutes of paddling I feel it before I hear it, Capes' deep baritone voice vibrates through my body and flows across the water like a warm breeze. I pause for a moment and breathe it all in. He continues to sing as we paddle, talking to his ancestors, calling on the wind and the waves, the sun and the sky. I like to think he sings the animals out. The Olive Ridley turtle that darts under our kayak, the stingrays, the cormorants overhead and, finally, the dugong, which stays at our side for almost an hour, its broad muzzle making soft breathing sounds each time it surfaces. As we continue across the aquamarine bay, I finally feel close to the heart of a land that existed long before Dirk Hartog dropped in and decided there wasn't much to see. The writer was a guest of Australia's Coral Coast and Tourism WA. Qantas flies daily from Sydney and Melbourne to Perth, from $219 one-way, see qantas.com. Skippers Aviation flies from Perth to Monkey Mia five times a week from $156, one-way, see skippers.com.au; or allow nine hours by car. Flights between Monkey Mia and Dirk Hartog Island can be arranged through Shark Bay Air Charter for $330 one-way, see sharkbayair.com.au. 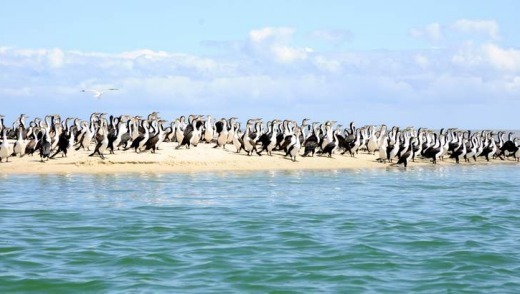 Dirk Hartog Island Eco Lodge has a three-night/four-day package for $1338 a person, which includes air transfers from Monkey Mia, Eco Lodge accommodation, all gourmet meals and cool drinks, full day Cape Inscription tour and a half-day blow holes 4WD tour. 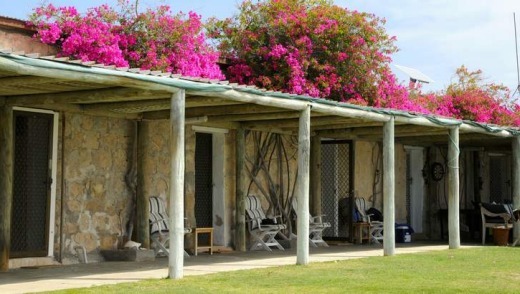 Self-contained, ocean-side villas are also available for $350 a night (sleep eight), see dirkhartogisland.com.au. Wula Guda Nyinda Eco Adventures offers a full-day Saltwater Dreaming kayak safari for $165 adults, $132 children, see wulaguda.com.au. Showcases natural and cultural treasures of the region. The $11 entry ticket is good for two days. See sharkbay.wa.gov.au. This 130-kilometre drive takes in Monkey Mia, Shell Beach, Little Lagoon, Eagle Bluff and the Hamelin Pool Stromatolites. See australiascoralcoast.com.au. There's a self-guided trail through the historic sheep station, but the best part is a soak in the artesian hot tub. See australiascoralcoast.com.au. Still worth a visit for the daily dolphin interaction, but there are also wildlife sailing cruises, indigenous tours and walking trails. See monkeymia.com.au. A great way to start your visit to Shark Bay is to learn about the local marine life. Don't miss the daily shark feeding. See oceanpark.com.au.